Hagaer is a Bosmer commoner who lives in the Temple District of the Imperial City. His big passion in life is reading and collecting books, and he owns the library to prove it. He can always be found inside his mansion between 6pm and 6am, eating dinner on the ground floor for two hours at 6pm and sleeping in his private quarters between 10pm and 6am. At all other times he can be found either wandering on the ground floor or visiting various destinations in the big city. On regular weekdays (Morndas to Fredas), he will wake up and spend an hour on the ground floor before leaving at 7am for the All-Saints Inn, where he finds himself an empty seat and enjoys a three-hour breakfast. He leaves at 10am for the Arcane University, where he spends six hours chatting with the many similar minded and well-read scholars and apprentices. At 4pm, he leaves to spend two hours in the city's popular Arboretum before heading home for a 6pm dinnertime. On Loredas, he will spend two hours on the ground floor before leaving at 8am. He will cross the street and enter the Temple of the One for an early morning prayer until noon. Then he spends all afternoon in the Arboretum, leaving for his 6pm dinner. On Sundas, he once again leaves at 8am, this time to spend his morning in the Arboretum. At 10am, he takes the long walk to the Market District and enters the Mystic Emporium for a chat with proprietor Calindil. He returns to the Arboretum at 4pm and strolls around a bit, before going back to his house at 6pm. He wears a set of upper-class clothing, consisting of a green brocade doublet, green silk garments, and a pair of green velvet shoes. He carries around his house key and a leveled amount of gold. 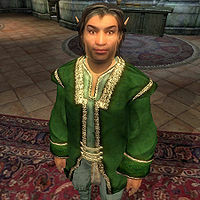 A Bosmer of few words, he will admit his addiction for the written word, even in his introduction: "My name is Hagaer. I don't get out much. Too many books to read." When asked about the Imperial City, he will elaborate: "It's terrible. I just can't walk past a bookstore. The First Edition, in the Market District, is the worst." Esta página foi modificada pela última vez à(s) 17h09min de 19 de outubro de 2013.